I had gotten out of class just as the sun was setting, when hunger pangs kicked in. My hair turned white and shorter, as I grow older, morphing into Betty White. “You’re not you when you’re hungry,” said the inner Snickers commercial in my head. It was right. Unfamiliar with the Long Beach food scene, I sat in the driver’s seat desperately scrolling through Yelp. I had no idea what I wanted to eat, yet I wanted to eat everything! Nothing stood out. At this point, I even considered nibbling on my arm. My unfamiliarity with Long Beach makes every meal a mission to get to know my city a little better with each bite. I was almost going to settle, when suddenly I found the one– Donburi Café. Tucked behind Johnny Rockets on Pine and 3rd in Downtown Long Beach is the newly opened Donburi Café. Donburi, literally translating to “bowl” in Japanese, specializes in just that - rice bowls. Each menu item ends in “don” for short, describing your choice of protein, seafood, or veggies over a bowl of rice. Dons are an extremely popular dish in Japan. The cashier, 26-year-old Bailey Higginbothan, explains that the Katsu Don and Oyako Don are the most popular items on the menu and in Japan. The Katsu Don is a deep-fried pork cutlet and egg, the Oyako Don is chicken and egg, and both dishes are served with sauce over rice. I got the Ebi Don, or shrimp tempura, the last time so this time I get a Katsu-Curry Don. All dons come with miso soup and a side salad with a uniquely flavored pineapple-based dressing. I take a seat at the deep brown wooden table as Jazz music faintly plays over the chattering of other diners. I anxiously wait for Bailey to call my name. Alas, my food is ready. I pick up a piece of curry covered katsu and rice with my chopstick, place it into my mouth and indulge in the tender piece of pork as I feel myself morphing from Betty White back to my usual self again. Donburi Café is the combined effort of Steve Chun and Amy Hong, who both hail from South Korea and share a passion for cooking. They wanted to bring healthier, more traditional options to Long Beach. Chun, 53, is a general contractor and designed all the wood and stone furnishing in the restaurant. Although both owners are South Korean, Steve has a Japanese background. “If you know the history of Japan,” he says, “it will make sense.” His mother was born in South Korea, but moved to Japan and remained there until South Korea gained independence from Japan. He still has many relatives there, which explains the strong Japanese-influence on the restaurant. Chun’s favorite dish here is the Unagi Don, grilled fresh water eel over rice. He previously owned a Japanese hot pot restaurant in Seattle 13 years ago, and has finally found his way back to his love for food. 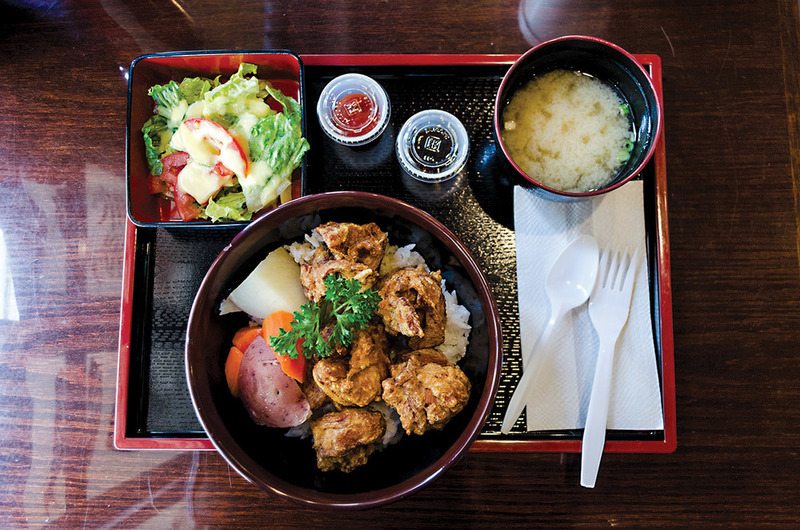 Donburi Café uses high-quality ingredients you can taste. Though I didn’t get much out of shy Amy, she did share one thing: “I want to provide good food to Long Beach.” And that they do.